The pumps shoes material is rhinestone,pearls,leather. 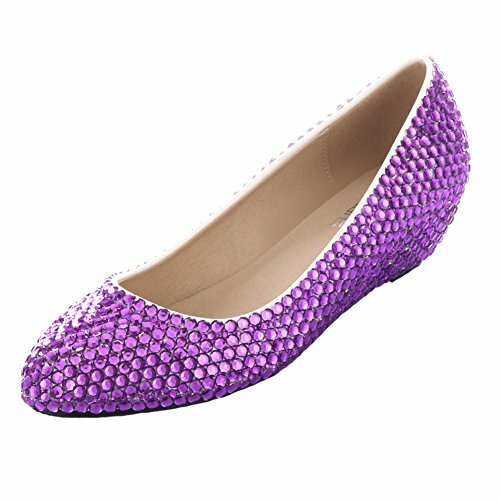 the rhinestone is handmade on the upper, sole material use rubber, Lining material is leather, and the colors is white,silver,purple,mulitcolor for bridal shoes. It's style of comfortable,wedge and platform for the pump shoes. The high heel is suit for wedding shoes, evening shoes and party shoes,It's fit spring, summer, fall, winter. High Heels: We have various of high heels, middle high heels, low high heels, wedge, flat about 5.5 inches, 4.5 inches, 2.5 inches, 1.2 inches and flat. If this products not have the high heels, you can search our brand of Velcans, you can look all high heels in the listings. Platform: Usually include 2 inches, 1.2 inches and flat platform for our listings. Crystal Rhinestone or Pearls: Handmade 1600-3600 rhinestones or pearls studded on Velcans shoes. Our designer need about 1-2 months for designing our a shoe, our designer used the crystal rhinestone, pearls, lace flower and other luxury material that studded on the shoes upper. Our designer need layout the rhinestone and pearls of material that show very gorgeous and sparkle for velcans shoes. Our designer said: "Every Ladies is Unique and Sparkle in all audiences". Shipping Faster - We using the FBA Fulfilled by amazon for orders and use the faster express carrier. Return and Replacement Warranty - Usually our customer need to return or replacement shoes, we free return for our Velcans. Quality Guarantee - Velcans through three times for our Velcans Items, Processing QC, In Stock QC, Out Stock QC. Color: Purple of High Heel:1.6"
If you have any questions about this product by VELCANS, contact us by completing and submitting the form below. If you are looking for a specif part number, please include it with your message.